Let’s face it, staying in a hotel can be pretty wasteful. All those take-out containers for food, those little soaps in cardboard boxes (or plastic wrap!) 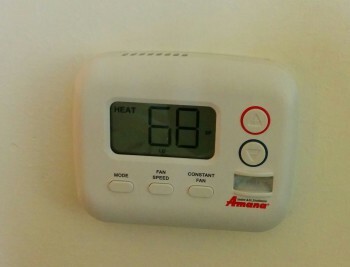 that get used three times before they’re replaced with a new one, and hard-to-control thermostats that lead to ice-box air conditioning even when no people are around to enjoy it. This week the Center for Sustainable Nanotechnology had one of our rare in-person meetings where we gathered from all around the country to talk science (and blogging!). We met at the University of Wisconsin-Madison, and many of us stayed at the Wisconsin Union Hotel, just down the road from the Chemistry Department. It turned out to be a good fit philosophically as well as geographically for our CSN meeting: the hotel had the most comprehensive approach to sustainability that I personally have ever experienced. 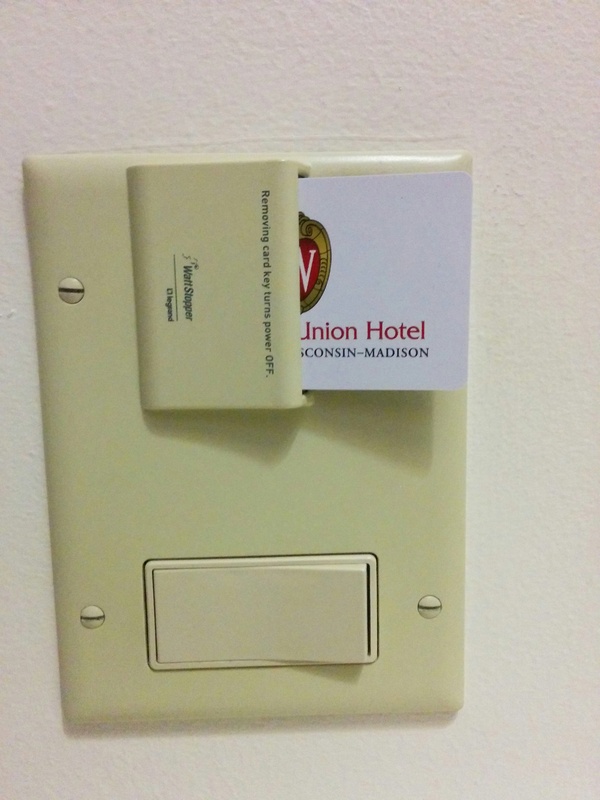 You literally cannot walk into your room at the hotel without noticing their sustainability efforts: the lights won’t operate unless you put your room key in a slot by the door! Want lights on in your room? Put your key card in the slot first. If the sustainability connection here isn’t obvious, don’t worry – it puzzled me for a few seconds, too. Then I realized that, even with the best of intentions to conserve electricity, it can be easy to forget to turn the lights off when you leave your room — you’re away from home and doing all kinds of exciting activities and there are ten different light switches around who-knows-where… but it’s hard to leave without your room key! When you pull your key out of the slot, the lights stay on for maybe 15 seconds (enough time for you to get out the door or into bed) and then everything in the room shuts off. It actually makes things easier, because you don’t have to go around switching every light off individually. 1. Reduced unnecessary laundry: This is one I’ve seen at hotels for years, and it makes a lot of sense. Let the staff know that you’re happy to re-use your towels and sheets and they won’t bother running them through the laundry. This saves water, electricity, soap, and employee time. A pretty common practice in recent years: hang your towels up if you’re willing to use them again tomorrow, and the staff won’t have to do unnecessary extra laundry. 2. 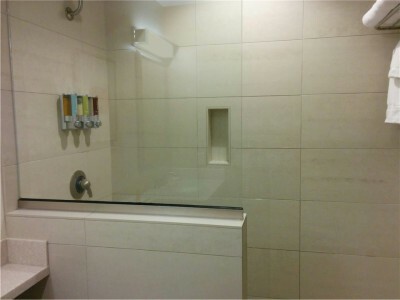 Shower design: Having shampoo, conditioner, etc. in dispensers on the wall instead of in little bottles improves sustainability in a couple of ways. Each guest uses only as much product as they need, and the hotel doesn’t have to refill, dispose of, or replace all those little bottles that people have half-used. I have too many tiny shampoo bottles at home already anyway. And did you notice there’s no bathtub? Showers use less water than baths (at least if they’re about 10 minutes or faster). That’s even more the case if you use low-flow showerheads, which this hotel does. And no shower curtain means less time and fewer supplies required for cleaning. 3. 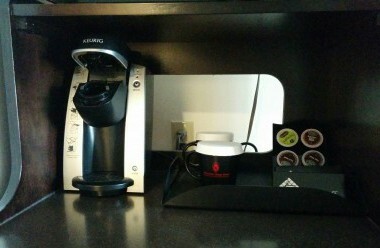 Coffee: I usually think of Keurig coffee makers as very problematic for sustainability, but then I realized that most hotel coffee makers are at least as bad in terms of packaging, with filter-paper coffee pods usually encased in plastic outer wrappers. And the hotel provided ceramic instead of paper coffee cups to further reduce waste. Single-serving coffee pods may reduce waste relative to typical hotel coffee systems, but do the mugs really need paper doilies on top? 4. Fridge & microwave: Yes, these appliances use some extra electricity, but if I’m staying in a hotel for more than a day or two I love being able to bring home restaurant leftovers (or groceries!). It saves me money and it reduces food waste when I get more than I can eat in one sitting. And although takeout containers sometimes involve wasteful packaging, being able to store and reheat food in my room means I probably use fewer of those containers than if I had to get a new order of something for every meal. 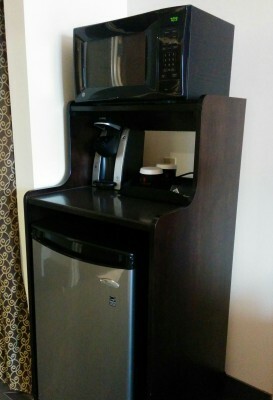 Refrigerators are not uncommon in hotel rooms, but I don’t often see microwaves unless I’m in a suite with a full kitchenette. 5. Thermostat: I didn’t use it on this trip, but it was really nice to see that I could actually control the temperature in my room if I wanted. That’s about 20 C for our European and scientist friends. 6. 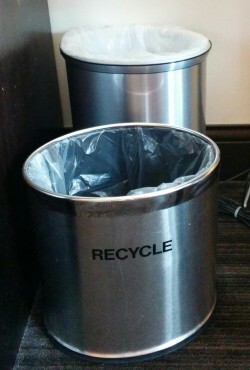 Recycling: I admit, having a designated recycling bin in my room was just as exciting for me as the fancy light switch. I don’t know how many times I’ve carried empty soda cans around a convention center or hauled piles of paper home in my luggage because I was afraid they wouldn’t be recycled if I left them at my hotel. Recycle? Yes, thank you, I will. 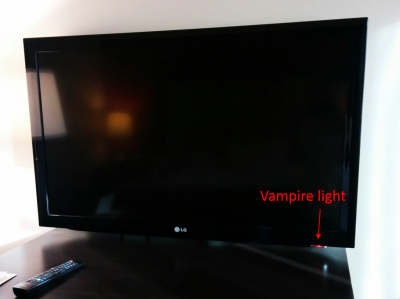 Does the TV really need to have a tiny red light that’s on all the time? Many manufacturers seem to think so. 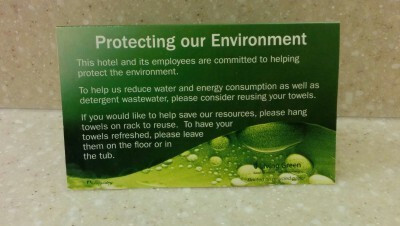 Many hotels are starting to implement more sustainable features like the ones I’ve described here. Some are simpler than others, and some can also save the hotel money right away while others represent more of a long-term investment. There are organizations like the American Hotel and Lodging Association and the Green Hotels and Responsible Tourism Initiative that support efforts like this, and I hope that someday they’ll be so commonplace that I won’t be surprised to see them when I walk in the door. Do you have any eco-friendly hotel stories or tips for sustainable travel? Tell us in the comments! Curious about Keurig? Check out James Hamblin’s “A Brewing Problem,” The Atlantic, March 2, 2015.